FOXTAIL + MOSS: What's in your vacation bag, Lauren? What's in your vacation bag, Lauren? I just got back from a long weekend in Nashville. My husband and I drove down there and absolutely fell in love with the city! Road trips are my favorite method of travel but whether I'm climbing in a car or hopping a plane, my carry with essentials are always the same. 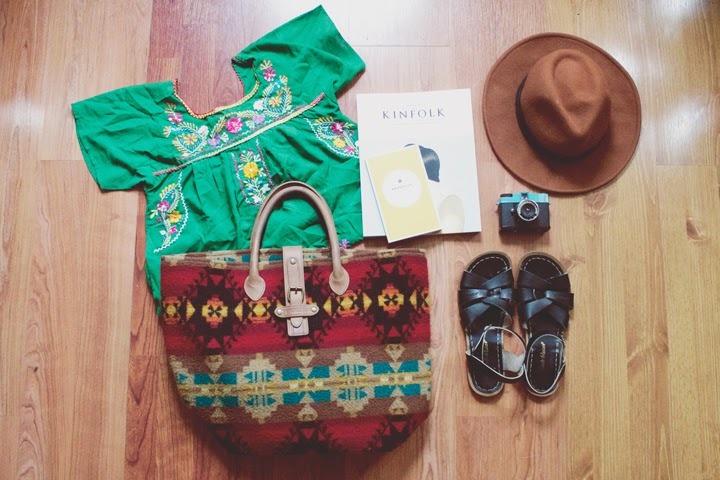 Vintage Oaxacan dress: This pretty embroidered dress is my go to road trip outfit. It's incredibly comfortable for sitting long hours in the car, yet I still feel cute and put together when we make the occasional stop at road side attractions, antique malls, or little towns along the way. Pendleton Tote: This bag is large enough to use as a weekender but easy to carry around like a tote. And the classic Pendleton pattern is just about to die for! Reading Material: I always bring a book or magazine or two on road trips or airplane rides to pass the time. This past trip I devoured the latest issue of Kinfolk. Also, we brought along our Nashville Wildsam Field Guide. This little book is equal parts travel guide and city tribute. It's full of local lore, interviews, hand-drawn maps, and personal essays, as well as tips on all the hippest places to check out. So cute and so useful! Diana Lomography Camera: In addition to my digital SLR and iPhone, I love to snap film photos on vacation. The Diana is my absolute favorite for film. How the roll will turn out is unpredictable at best; there's usually lots of light leaks and double exposures. But that just makes me love the photos that much more! Hat: Hats and traveling go hand in hand. They keep the sun off your face and add a "cool girl" element to every outfit. I thrifted this hat years ago and seriously wear it almost every single day in the summer time. Needless to say, it's seen better days. I have my eye on this gem for when my old standard finally bites the dust. Saltwater Sandals: Saltwaters are the only sandals I need when traveling. In Nashville, I wore them wading through a river while hiking in a state park and then later that evening paired them with a maxi dress for dinner. They're ridiculously comfortable and super cute to boot! Where are you traveling this summer and what are your carry with must haves? Happy road tripping, friends! What a perfect tote! I love it.